Sunday, July 17, 2016…A day we will never forget. The day three of our own brothers were gunned down in a senseless act of cowardice. They may be gone, but will never be forgotten. Mathew Gerald, Montrell Jackson and Brad Garafola are true heroes. Please join us in praying for their families and the speedy recovery of all other law enforcement officers injured on that day. the past couple of weeks. You have worked long and tireless hours, and despite being cursed and threatened, you represented our Department in a professional manner. 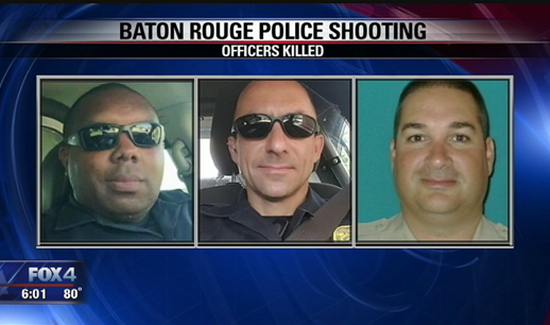 The Baton Rouge Union of Police stands behind each and every one of you for the job you have done. Through your grief and in extreme circumstances, you continue to protect and serve the citizens of Baton Rouge as you were sworn to do. We would also like to recognize all of the Officers who have come from agencies from all over the State of Louisiana to provide support for the Baton Rouge Police Department. Your assistance and camaraderie has proven that we truly are all “family”. Thank you from every member of our Department. When we needed you, you were there. incite hate and chaos during this crucial time. Lastly, we would like to thank the citizens of Baton Rouge who have shown overwhelming support for all law enforcement during these critical times. Your expressions of gratitude with food, kind words, and even tears have kept our Officers going. Knowing you stand behind us means everything. Chief Dabadie, Sheriff Gautreaux, Colonel Edmonson, Mayor Holden and Governor Edwards, you have the support of the Baton Rouge Union of Police to lead us forward and to ensure that there is no more bloodshed of our officers. Together we will keep our community safe.